Rolando and Lorena Herrera, owners of Napa Valley’s Mi Sueño Winery (Spanish for ‘My Dream’), welcome you to experience the culmination of their decades long journey from Mexican immigrants to owners of one of Napa’s leading boutique wineries. Their journey is a love story and the story of the American dream realized. Rolando and Lorena came to this country as children and both grew up immersed in the wine industry. 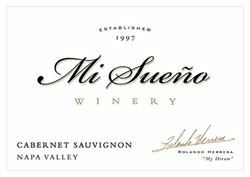 In 1997, the year of their marriage, they founded Mi Sueño Winery after decades of hard work and training with masters in the wine industry. Join us to share in their passion for farming, Napa, their family, and their heritage. Discover one of Napa’s best kept secrets and visit our working winery and taste amongst barrels of aging wine. Please visit www.misuenowinery.com for more information and to schedule your appointment. Our tasting room is what we refer to, "a cellar-integrated tasting room". Since we are a production facility, we have carved out some space to host folks in our tasting room. We have rustic-style, hand-carved furniture that we use and french bulbs to illuminate our tasting area. We have a long table to do sit down tastings for up to 8ppl and a lounge space to keep things more casual. We use varietal specific stemware to showcase our wines to the fullest. Wine Education: We use varietal-specific Riedel stemware to showcase our wines. To join the wine club, visit https://www.misuenowinery.com or call 707-258-6358. The only way to savor the dream from the comfort and convenience of your home. We offer multiple membership opportunities for you to choose from. Each shipment features our newest release selections and are completely customizable to suit your tastes. Discounts on all bottle purchases. Invitations to member-exclusive events at the winery throughout the year. Complimentary tastings for you and three additional guests at our winery in Napa Valley.